Mystery hijacker DB Cooper... or is it?! In 1971, a man boarded a Northwest Airlines flight from Portland, Oregon, to Seattle, Washington. He sat on his seat, ordered a bourbon and water, smoked a cigarette, and when the stewardess came to check on him, he passed her a note reading, “I have a bomb in my briefcase. I will use it if necessary. I want you to sit next to me. You are being hijacked.” By that afternoon, the plane had landed in Seattle and the hijacker known as DB Cooper was flying away, with $200,000 in his pockets and a parachute. By 8:13, DB Cooper had disappeared forever. 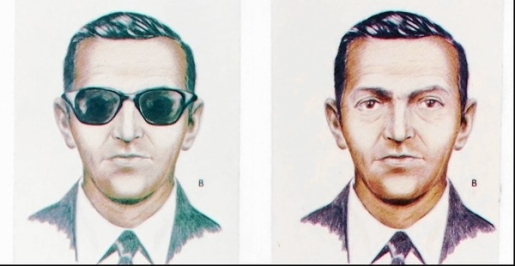 Now the FBI is exploring a new lead in the 40-year-old unsolved mystery of the disappearance of DB Cooper. However, the FBI is investigating the new tips, trying to match the fingerprints of the unknown man from the Northwest cockpit to the charred $20 bills found on the ground in the Pacific Northwest near where Cooper bailed out. A credible source maintains that Cooper died 10 years ago, and the FBI is looking into the matter.